The Collier’s job was devoted to converting wood into charcoal. It was a tiring job. Charcoal would burn longer and more evenly than wood in its natural form, and so it was the perfect fuel for the industry of iron making. It should be remembered that this south-central region of Pennsylvania was dominated by the iron industry for quite a number of years between 1805 and 1890 - practically the entire 19th Century. The region encompassed by Old-Greenfield Township was home to two iron furnaces: Sarah and Martha, and an iron forge: Martha. The task of the collier to produce enough charcoal to keep these ironworks operating was a demanding one, and can explain why there were so many individuals engaged in the profession. In order to produce charcoal you must burn wood in conditions which do not allow sufficient oxygen for complete combustion. Such was the work of the collier. During the fall, winter and spring the colliers would cut down everything with bark on it. Large trees would be cut down into four-foot lengths and then these were split into billets. 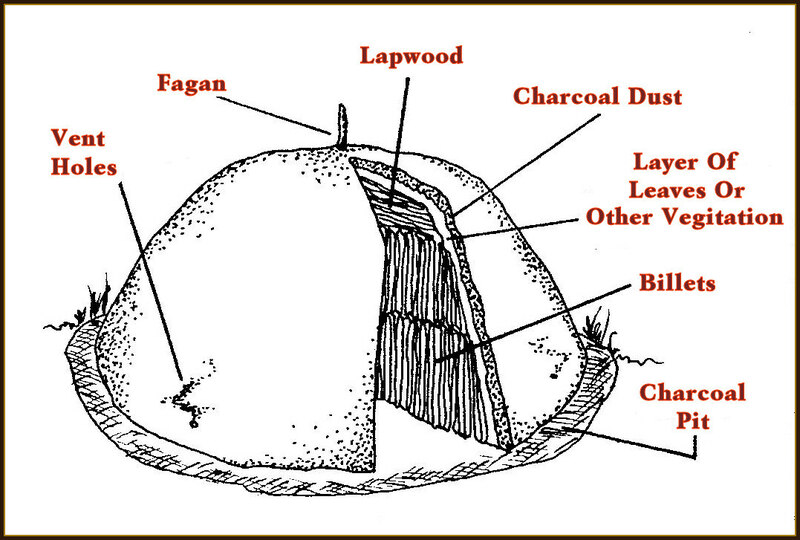 Lapwood would be cut from saplings or smaller tree limbs. The summer months were reserved for the actual charcoal making because the winds would not be as fierce then. With all the wood cut and prepared, the colliers set to work at preparing their pit. This was not really a pit, but rather a circular space on which the billets were stacked in a mound to be burnt. At one time wood had been burnt in actual holes in the ground, and from this the term pit evolved and remains to this day. The pit would have a flat, circular hearth of nearly fifty feet in diameter around which the charcoal dust from the previous year’s production would be raked. This dust would be needed in the current year’s process, and so it was carefully raked and maintained. The lapwood and billets would be arranged in an ordered fashion. A chimney would be constructed first. 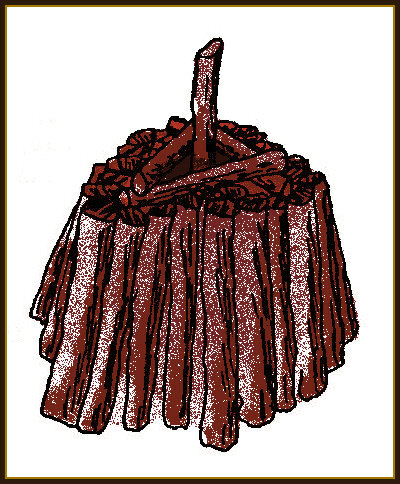 Sometimes a single pole of greenwood was stood upright, around which the lapwood was arranged; the pole, or fagan, being utilized to support the lapwood. In some collier’s methods the billets would be laid in a triangular fashion, one end upon the top of the previously laid piece of wood until the whole series of intertwined billets would reach a height of about eight to ten feet. Whichever method was used, the end result was an encircled air space up through the center of the entire mound. The chimney space would be only a few inches wide - only a small flue was needed. Heavier billets would be stacked vertically against the central chimney construction in the second stage of the mound’s structure. Round and round the central chimney the collier would place his billets in such a way as to not leave too many open spaces between each individual billet. The smaller lapwood was used to fill in any open spaces that would not be taken up by the billets themselves. The circle would be developed to a point where its width would allow the collier to climb onto it in order to begin a second row of billets above the first. The two levels would be continued together until the entire circle would be filled and a mound some thirty to fifty feet in diameter at the base, and eight feet in height would be completed. The smaller lapwood was then placed on the very top to further develop the mound shape. The final stage in the construction of the mound consisted of the placement of leaves, straw or some other vegetation over the entire wood structure to a depth of at least four inches. Next, the charcoal dust, which had been carefully stored on the perimeter of the circle would be spread over the vegetation layer. The collier would carefully form vent holes on the side of the mound opposite the direction of the wind. 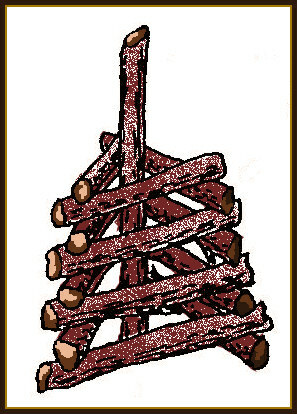 Dry kindling would be dropped into the chimney and the bridgin, a closing layer of billets over the open space of the chimney would be prepared. A shovelful of hot coals would be poured down into the chimney, the bridgin would be placed over the hole, and then the chimney would be completely covered with a layer of vegetation and dust. From this point the colliers had to be constantly alert and watchful lest the mound burn open and ruin all their work. The totally enclosed mound would have only the limited air supply through the vent holes and would therefore smoulder rather than flash into fire. If the vent holes emitted only a faint bluish smoke, the collier knew that the center was smouldering properly. The darker the emission grew, the greater the danger that the center was receiving too much oxygen. In the event that air was getting into the mound through holes that would develop in poorly stacked sections of the mound, the collier would fill the hole with more dust and vegetation and then watch the vent holes to determine if his manoeuvre had succeeded in cutting off the air supply. Also, if the wind changed direction, the vent holes would have to be plugged and new ones located on the opposite side of the mound. Because of this necessity to keep a close watch on the mound, the colliers would live in a simple hut close to their pit; it was a very rugged and rough work in which to be involved. The collier knew by instinct when the smouldering fire had worked its way through the entire mound. He would confirm his instinct by poking a thin pole into the mound at various places across its surface. If the pole moved easily through the pile, reaching the bottom without obstruction, the collier could be certain that the pile was evenly consumed. He would then start to ring out the charcoal by digging a wide hole at the base, drawing the charcoal out with rakes until any remaining embers would flare up into fire. The hole would be closed again, and another would be cut open in another spot where the charcoal might be less volatile. The coals extracted from the pit would be quenched with water, and then loaded onto a wagon to be transported to the furnace for use as fuel. The collier’s job was of utmost importance to the iron furnace because the quality of his charcoal product determined the even firing capability of the furnace. A parallel can be found in the use of different types of coal. A type known as “nut” coal will give a different kind of heat than “soft” coal will. If the two are mixed, the furnace’s fire would be uneven and hard to gauge and maintain. The collier’s understanding of how to achieve a uniform product for his employer was important to the whole process.